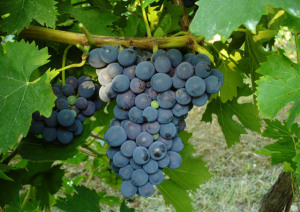 Pugnitello is an indigenous or authoctonous grape variety from Tuscany, discovered in 1981. In ancient times, the Etruscans were the inhabitants of this area, before they were overrun by the Romans a couple of centuries BC. They were early cultivars of the vine – though they usually let the vines climb along trees in trails the vines set themselves. In recent years, scientists, winemakers and vignerons have been concerned by the attrition of grape vine varieties – in what they call the “genetic erosion” of Vitis vinifera – due to, among other reasons, the phylloxera blight and selection of specific varieties to the exclusion of others. In response to this, the University of Florence in conjunction with the some Farm and winery sought to rediscover and cultivate authoctonous vines. In what has been a mammoth project, all the existing vines in Tuscany have been attempted to be represented. These have been verified genetically as distinct varieties, and in all, about 230 were grafted on rootstocks and cultivated. Of these, only about 30 bore grapes suitable for wine (by a process called “microvinification”, simply meaning small quantities of wine were produced from each plant). Pugnitello vinification Early vinification in 2003 showed the Pugnitello qualities. It gets its name from the shape of the bunches, which is said to look like a closed fist – in Italian lang. “pugno” – , or from the ancient Roman tradition to give wine to the souldier before the battle in latin named “pugna” meaning that probably the Pugnitello was a perfect grape to make strong wines. Being a new variety, oenologists are still learning about its qualities and characteristics, and which winemaking techniques best suit it. For this reason our farm spent the latest years in different kind of sperimentation in cooperation with the vines research center CRA of Arezzo.